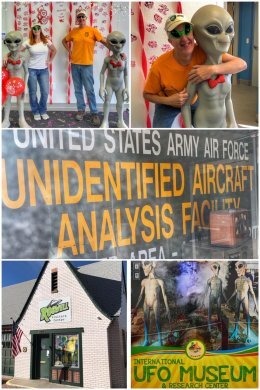 Whether you believe or not in unidentified flying objects (UFOs) or aliens crash landing in a remote part of New Mexico, you will find lots to do and think about when visiting Roswell, now one of the largest cities in New Mexico (and the largest in the southeastern part of the state) — and home to alien lore (and tourism). Roswell is known for farming, dairying, ranching, manufacturing, and petroleum production … who are we kidding? Roswell is known for an event that did not even happen in the town. The alleged 1947 UFO crash site is actually 75 miles away from town, but the investigation and debris recovery was handled by personnel from the Roswell Army Air Field. Conspiracy theorists have long since contended that the government retrieved the spacecraft, imprisoned the aliens, and covered the whole incident up. 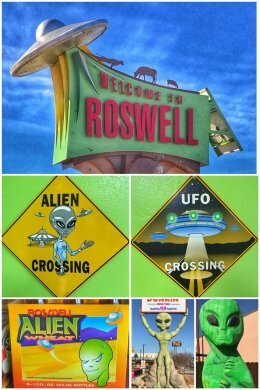 While we may never know the answers to that UFO sighting — or the thousands of others all over the country — we CAN say that Roswell gladly takes all the alien attention to heart… and no more so than at the Roswell Visitors Center, which is a must-stop while in town. You can pick up a few goodies, find lots of helpful literature, talk with friendly staff, and get your picture taken with a few peace-loving aliens! You can also check out the visitor center online here: See Roswell. 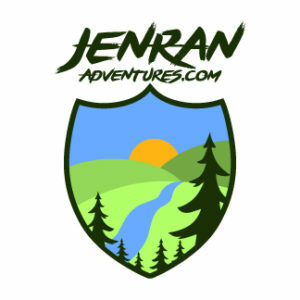 The whole downtown is all about aliens — with many souvenir shops (located on both Main and First streets) as well as the UFO Museum and Research Center. Walking through downtown is both a healthy and fun activity. While we loved walking around the main part of town and snapping pictures of all the aliens, we were a bit disheartened that other parts of the town are pretty run down. The town supposedly reinvented itself as a retirement location because of the weather — but we witnessed a lot of rundown homes and businesses. We will say that the town has just about every fast food establishment known to man, including one we both thought was defunct: Long John Silvers. The highlight of this stop for us was of course one just a bit more grounded here on Earth. 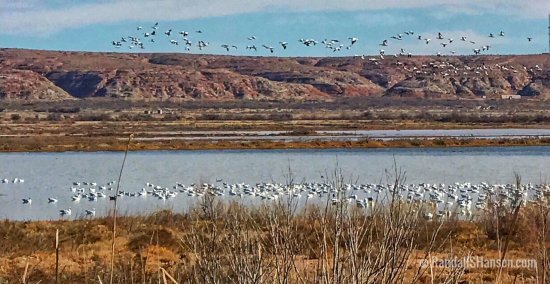 Located northeast of town, along the Pecos River, sits the Bitter Lake National Wildlife Refuge. The refuge was established in 1937 to provide habitat for migratory birds along the Central Flyway — including the Snow Goose and Lesser Sandhill Cranes, as well as 20 duck species (including northern pintails, mallards, canvasbacks, gadwalls, northern shovelers and four species of teal; the cinnamon, American, green and blue-wing, and blue-wing). It is also home to more than 100 species of dragonflies and damselflies, 50 reptiles and amphibians, and 28 fish species. In addition, a number of endangered species (including Noel’s amphipod and Roswell springsnail) call the refuge home. As with most national wildlife refuges, the native animals greatly outnumbered the small number of people visiting. Water is abundant in the refuge, including many wetlands, the river, the Roswell artesian basin, flowing streams, playa lakes, and brackish waters of the refuge’s namesake, Bitter Lake. As has been the case at many other national wildlife refuges, the staff at Bitter Lake have been restoring conditions to what they had been before farming and ranching diverted water and changed the landscape. We drove the entire 8-mile auto-tour loop, stopping first at the closed visitor center — thanks President Trump and Congress for still getting paid while shutting down the government and making pawns of lower-level federal workers and making it more difficult for the American people to experience OUR lands. The Butterfly Trail is a quarter-mile hike that offers interpretative information, including about Comanche Bluff — where the one of the largest bison herds in North America once roamed. 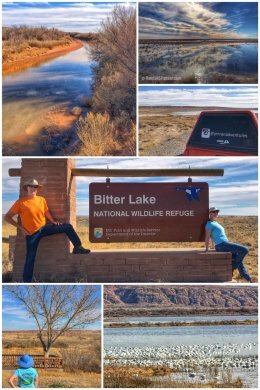 From there, we hiked the Dragonfly Trail, Desert Upland Trail, and the Oxbow Loop Trail (which takes you to the banks of the Pecos River) — altogether about 4 miles. We also stopped at the Sandhill Cranes Overlook, Goose Hill Overlook, and Observation Blind before completing the loop. 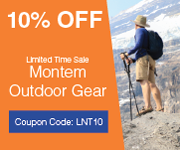 Also located near Roswell — to the southeast of town — is Bottomless Lakes State Park, the first state park established in New Mexico, and named for nine small, deep lakes located along the eastern escarpment of the Pecos River valley. While we did not have time to visit it, the park is definitely worth a visit in spring and/or summer. Next up we zag back west over the Sacramento Mountains to Alamogordo to attempt to visit White Sands National Monument and do some more wine-tasting. Next Post:Stop 71: Alamogordo Adventures!